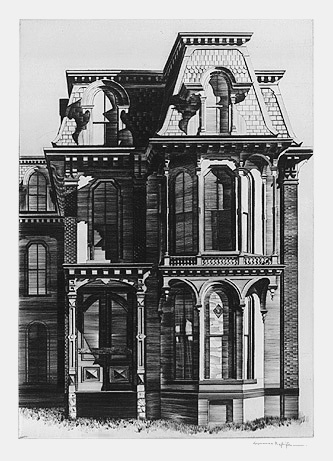 Saratoga Springs Victorian - - 1940, Drypoint. Image size 13 7/8 x 9 3/4 inches (352 x 248 mm); sheet size 16 15/16 x 13 inches (430 x 330 mm). A superb impression in warm black ink, on cream wove paper, with full margins (1 1/4 to 1 3/4 inches), in excellent condition. Published by Associated American Artists. Purchase Prize, Second Annual National Fine Print Competition. 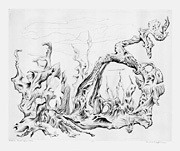 European Landscape - - 1942, Drypoint. Edition 50. Signed, dated, titled, and numbered 7/50 in pencil. Image size 10 3/16 x 13 inches (259 x 330 mm); sheet size 13 1/16 x 16 1/2 inches (332 x 419 mm). A superb, finely articulated impression, on cream wove paper, with full margins (15/16 to 1 3/4 inches), in excellent condition. 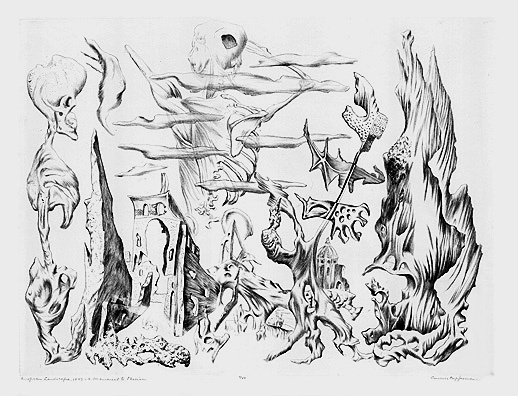 European Landscape - A Memorial to Fascism - - 1943, Drypoint. Edition 50. 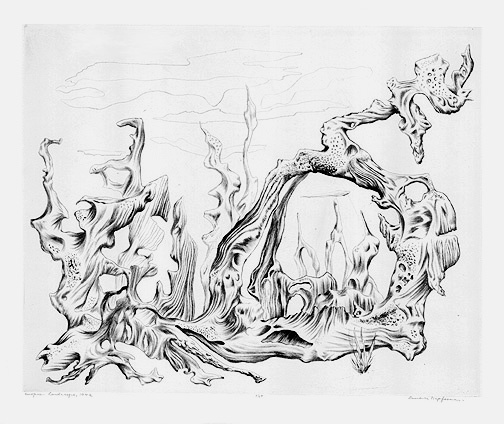 Signed, dated, titled, and numbered 4/50 in pencil. Image size 10 5/8 x 13 7/8 inches (270 x 352 mm); sheet size 13 x 16 5/8 inches (330 x 422 mm). A superb, finely articulated impression, on cream wove paper, with full margins (13/16 to 1 1/4 inches), in excellent condition.